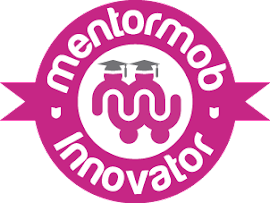 A random Twitter conversation between myself, Andrew Swan, and Matthew Moore led to the launch of a flipped learning chat modeled after good flipped learning practices. You can read the goals and purposes in the image above. 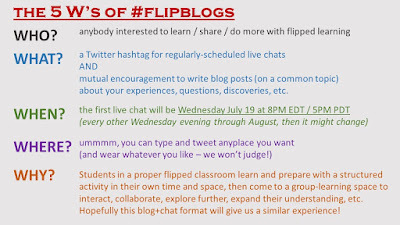 I hope this encourages many of you to open up the walls of your classrooms by blogging about the prompts that will be posted to the #flipblogs hashtag. Here is my attempt at going back in time to share a moment from my classroom. If you'd like to read more, check out my weekly reflection posts (2011-2012, 2012-2013, 2013-2014) or my book, full of practical strategies, examples, and recommendations at bit.ly/FWKirchBook. 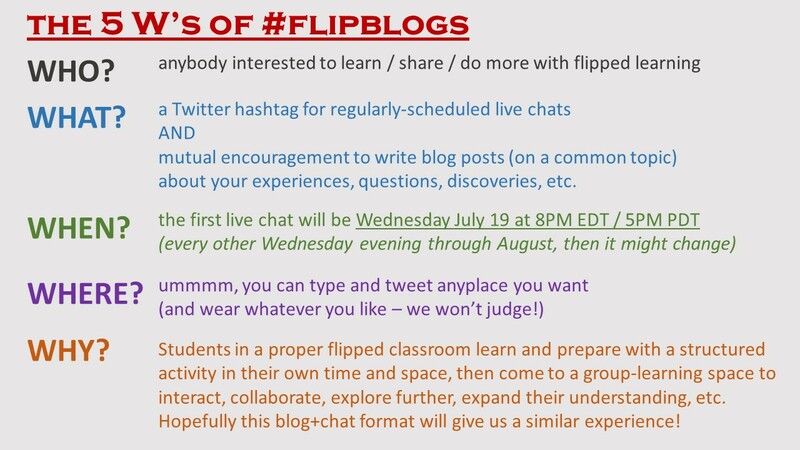 I hope to chat with many of you during the Twitter Chats on #flipblogs! I was in my 5th year of teaching when I started flipping my class. I remember having an unfulfilled desire every year: I wanted my students talking more and writing more in my math class. I tried so many strategies that I learned about in different workshops, but I was not able to find a way to successfully and consistently provide opportunities for my students to talk and write to the extent that I desired. One of my first posts when I started blogging back in 2012 was titled TWRLS, and briefly explains the transformation I began seeing in my students being able to show their thinking through writing, reading, listening, and speaking. (Note: Later I added and "I" in the middle for "Interacting" and it became TWIRLS. Someone at a webinar I was hosting mentioned it in the chat and I loved it, so I added it!). It was so rewarding and gratifying to find a way where daily my students were taking their learning to the next level and expressing their learning to me (and their peers) in many more ways than just solving rote problems. Students don't "Watch a Video", they complete a WSQ. I'm going to just direct you to the 4-part series linked in the previous paragraph (Part 1, Part 2, Part 3, Part 4) or to my book to learn more about how to utilize the WSQ method effectively. Please ask questions in the comments and I'll clarify or direct you to a more specific place. Class time transformed from having students be able to just work on practice problems and get individualized attention and support to a place where I was actually able to talk with every student every day (it's not just a coined phrase - it can actually happen!). Because we started class with a WSQ Chat (see part 4 linked above) and then provided opportunities for students to process their learning and demonstrate their understanding through blogging (see more student blogging resources here), I began to see that it wasn't just me (the teacher) who could demonstrate TWIRLS in class. It became my goal that my students were always the one demonstrating the most TWIRLS on a daily basis. I can't just pick one story to share in this post...so I decided to pull a video from the archives where my students share about their experience and how the flipped classroom helps them demonstrate TWIRLS in many ways. It's 10 minutes long, but I think hugely valuable to give a window into my story. 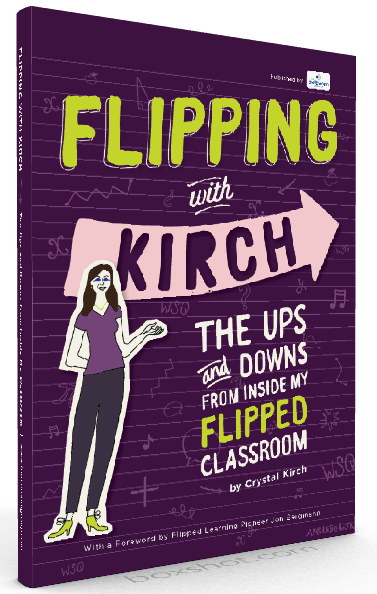 Author, Flipping with Kirch: The Ups and Downs from Inside my Flipped Classroom. I have said since I first flipped that one of the biggest benefits of a flipped instruction is I get to hear my favorite sound in the world - student math talk - almost every day! 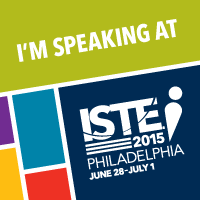 It's awesome that you have a video of students in action to illustrate this concept ... I really should do something like that! The "I" is important to add, and none of the other elements should be taken away: you've really got the essential elements all included! Yes! Get videos while you can. I wish I had one of a couple full class periods recorded that I could edit together to make "a full day in the life". But I never did it, and now it's too late. Get student quotes - I had questions they answered on a survey and then I filmed them. So valuable to have! !